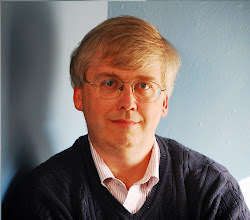 For a few years now, one of my mental images of the world economy is that the U.S. economy is by far the major importer of capital, while the major exporters of capital are China, Germany, and Japan. While that mental image remains true, the situation isn't as extreme as a few years back. Here's are the pie graph for 2005, from the Global Financial Stability Report of the IMF. 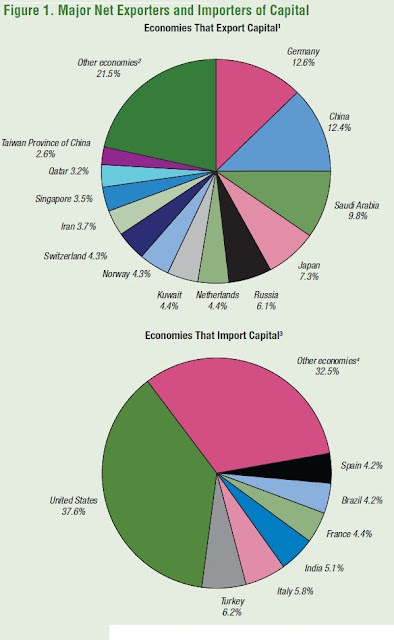 That year, the U.S. economy absorbed nearly two-thirds of all global capital imports. 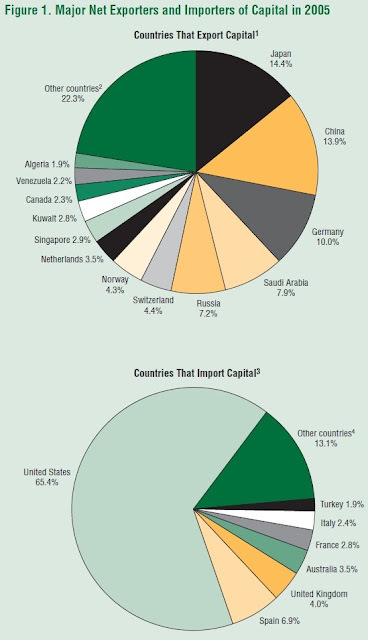 Japan was the major exporter of capital that hear, followed by China and Germany, with Saudi Arabia and Russia also playing large roles. Now here's the comparable graph for 2011. The U.S. economy is now absorbing only about one-third of all global capital imports. Germany has become the world's largest capital exporter, edging out China, and then followed by Saudi Arabia and Japan. On the U.S. side, a large part of what is driving this change is the reduction in the U.S. trade deficits. Here's a figure showing U.S. current account balances as a share of GDP, created with the ever-useful FRED website run by the St. Louis Fed. 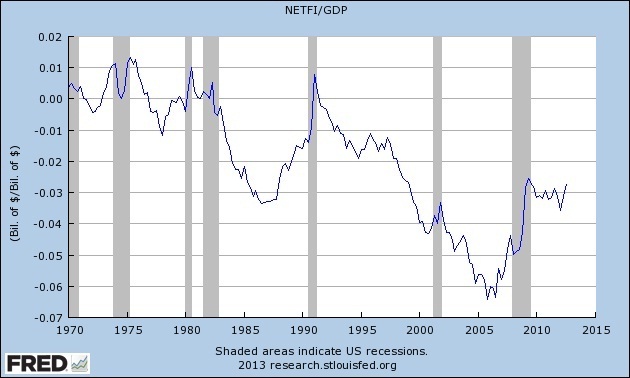 After the trade deficit had truly plummeted around 2006, at the worst of housing bubble, it is now back to the depths plumbed during the mid-1980s. 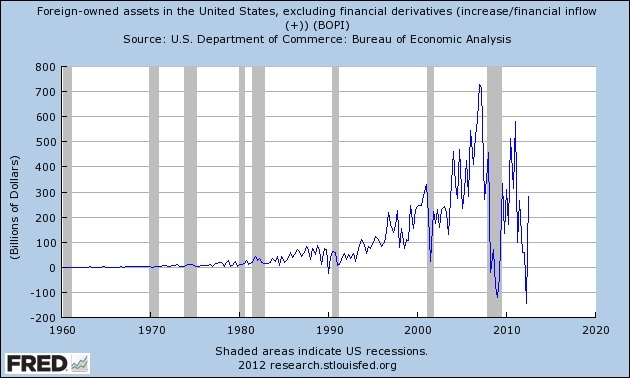 And here's a figure showing quarterly inflows of foreign capital to the U.S. economy. 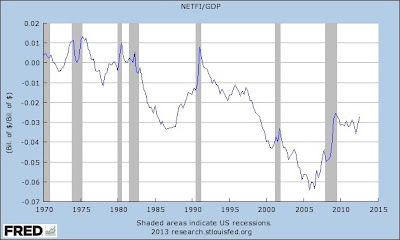 Notice how the U.S. economy became dramatically more dependent on inflows of foreign capital as the housing price bubble inflated during the mid-2000s. In addition, one the reasons behind the financial crisis and lack of available capital during the darkest times of late 2008 and early 2009 was that inflows of international dropped so dramatically--actually turning into outflows for a brief time. The inflow of international capital then rebounded before plummeting again, and turning into outflows during the second quarter of 2012. Thus, it's fair to note that the U.S. economy is not absorbing the same share of global capital imports as it was a few years back--but it still absorbs an outsized share of global capital imports. 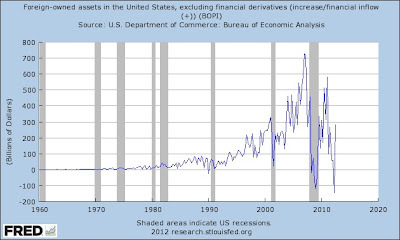 In addition, the sharp drops in the quantities of foreign capital coming into the U.S. economy, both during the Great Recession and then from mid-2010 into early 2012, show how the U.S. has come to depend on these inflows of capital imports--and how the U.S. economy can be vulnerable to these inflows being disrupted.